Once again the big event is here. Craft Hobby + Stitch International and Stix2 will be there. We will be part of the biggest and best trade event for the industry in the UK! CHSI is the one place every year where your industry come together! There are over 200 Exhibitors from all over the world attending this fantastic event! Birmingham NEC 15th - 17th February 2015. 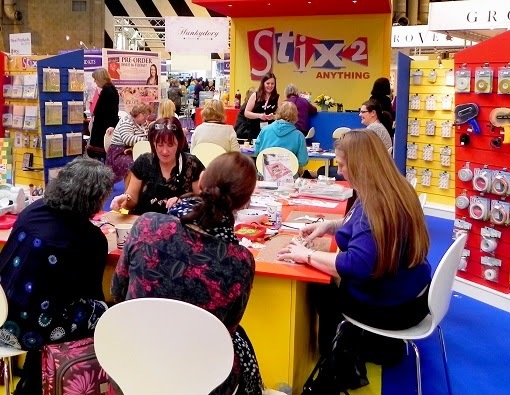 Or why not join in a Make and Take with Karen at the Stix2 Stand FO6. CHSI is the ideal place for us to meet our Customers both old and new and showcase all our fantastic new products (and maybe a cheeky show exclusive deal.) Also put your business card in our cup for a chance to WIN a Stix2 Bundle. We look forward to seeing you, come to the stand any time to meet our sales team, place an order with exclusive show deal or arrange a day for one of our demonstrators to come to to your store. But don't forget to register. Any questions please feel free to contact us on 0191 2697810 or email sales@stix2.co.uk Our count down has started and we cant wait to see you there.